"China A-Shares Will Be One Tenth Foreign Owned in Ten Years: MS," the headline on Bloomberg said a few weeks ago. It wasn't even really a story... more a list of bullet points about a research report from the investment bank Morgan Stanley. But the first bullet point floored me. Why? Because it said a total of $2 trillion could flow into Chinese A-shares over the next 10 years. Morgan Stanley sees foreign ownership of China A shares reaching about 10% in 10 years from the current level of 2.6%, with annual A-share inflows normalizing at around $100bn-$220bn. Over 10 years, $100 billion to $220 billion in annual inflows adds up to a maximum of $2.2 trillion. As I explained yesterday, MSCI recently revealed the next step of its plan to shift money into Chinese stocks. That will lead $45 billion to move into Chinese A-shares this year. That's a drop in the bucket compared to what Morgan Stanley believes is possible. It's only the beginning. And it's another reason why the long-term opportunity in Chinese stocks is too good to pass up. Up until this point, the big U.S. investment firms have been nearly silent on this subject. While I've covered the MSCI inclusion in detail for years – before it was even a done deal – Wall Street has been a step behind. Now, it's finally catching up. Remember, Goldman Sachs sees 50% upside in Chinese stocks in part because of the major investment flows coming. And now Morgan Stanley is also giving specifics on what it sees for the coming shift in Chinese A-shares. It means this story is finally becoming more mainstream in the investing world. The general public will soon be on board with the ideas I've been sharing for years. The dollar amounts Morgan Stanley believes will flow into China are larger than even I believed possible. In other words, Morgan Stanley just told the investing world exactly how big this shift is going to be. Until recently, most investors wanted nothing to do with China. Falling prices scared folks out of the market. But if Wall Street gets on board, and average investors follow, then look out... That could really cause an avalanche of activity. I expect that sentiment change could happen as more positive news like this comes out of Wall Street. And the numbers Morgan Stanley put on the coming MSCI shift are just as exciting. Morgan Stanley sees a "2019 target for a record $70b-$125b of inflows" into A-shares. It believes Chinese A-shares will be fully allocated into global indexes by about 2027, specifically saying it "sees MSCI's A-share inclusion factor reaching 100% in the next 5-8 years." Again, it expects that after this year, the annual foreign A-share inflow will be $100 billion-$220 billion per year over the next decade. That means well over $2 trillion could flow into Chinese A-shares. That's absolutely huge. It's more than double what I'd initially believed possible based on this shift from MSCI. But it's what Wall Street is predicting right now. Morgan Stanley also expects foreign ownership of Chinese A-shares to quadruple over the next decade – from 2.6% today to about 10% – according to the Bloomberg story. That's the amount investors outside of China will own. We're in the early stages of an unstoppable trend. It's one I've covered for years. Now, Wall Street is finally latching onto the story. This is huge news. And it's why investors can make big money in Chinese stocks now. The uptrend is finally back in China. And that's why I believe Chinese stocks are one of the best global opportunities right now. Don't miss it. P.S. The boom is underway in China... That's why the latest issue of my True Wealth newsletter covers the best and simplest way to profit from this shift. I can't share it today out of fairness to my subscribers... but you can access this recommendation with a risk-free trial today. For more details about how to sign up, click here. "Chinese stocks have been leading the global market higher this year," Steve says. "Even Wall Street is getting on board." Recently, one of the major investment banks wrote a report on the potential upside... Get the details right here. "There's a tectonic shift coming for the Chinese stock market," Steve writes. "And the ramifications are far-reaching." Read more about what could be the biggest China story he's covered here: The 'Chinese Nasdaq' Is Set to Launch This Year. 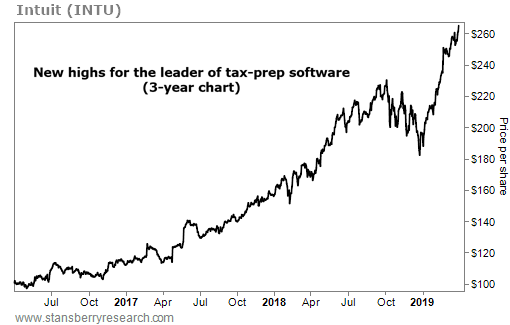 Intuit (INTU) is the $68 billion maker of TurboTax and other financial tools. Renowned for its user-friendly design, TurboTax is the best-selling software for filing your taxes online. Its most popular “Deluxe” edition starts at $60 for federal tax filing… And as Americans grapple with shifting tax laws, Intuit isn’t short of customers. The company reported $1.5 billion in sales for the most recent quarter… up 12% from the same period last year.